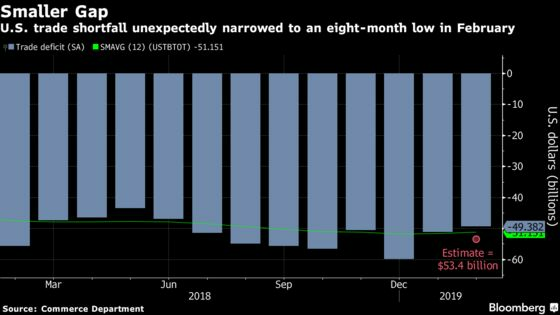 (Bloomberg) -- The U.S. trade deficit unexpectedly narrowed to an eight-month low in February on a surge in civilian aircraft exports, which may come under pressure after the grounding of Boeing Co.’s 737 Max planes. The deficit in goods and services declined to $49.4 billion from $51.1 billion, reflecting a 1.1 percent rise in exports and a 0.2 percent increase in imports, the Commerce Department said Wednesday. Analysts had projected a widening to $53.4 billion. The merchandise-trade gap with China -- the main target of President Donald Trump’s trade war -- narrowed to $30.1 billion. Compared with the first two months of 2018, the trade deficit narrowed 7.6 percent, which may give fodder for Trump to boast of progress on winning more-favorable trade terms after the gap ballooned last year. Yet exports will face difficulties including slowing global growth and Boeing’s woes following two fatal crashes, while an inventory overhang at U.S. businesses may weigh on imports. For now, the February data suggest net exports are on track to make a positive contribution to first-quarter economic growth, with the second straight monthly narrowing of the overall goods- and-services deficit. Wednesday’s figures showed the goods gap shrank to $72 billion, while the surplus in services increased to $22.6 billion. Shipments abroad of civilian aircraft rose $2.2 billion, or 60.5 percent, in February from the prior month, easily leading all categories of goods. Other sectors with gains included passenger cars, pharmaceuticals and crude oil. Imports of consumer goods rose, while industrial supplies and materials declined. Wells Fargo & Co. analysts said this week that the Boeing 737 Max grounding will cause a drag of about 0.2 percentage point on U.S. economic growth in the second quarter, amid production cuts and halted deliveries. The latest data may partly reflect companies rushing to beat what at the time was Trump’s March 1 deadline for boosting levies on imports from China. Trump gave an indefinite reprieve on the tariffs in late February, citing “substantial progress” in negotiations, which are showing signs of nearing an end. Even so, imports from China fell 3.6 percent in February from the prior month while exports to the nation rose 21.6 percent. The underlying trend in trade with China can be difficult to gauge at the start of the year because of different timing each year for the Lunar New Year holiday. In the first two months of 2019, the U.S. merchandise deficit with China narrowed from a year earlier. But both imports and exports declined sharply, potentially reflecting the trade war’s impact. The report also showed American soybean exports rose 15.6 percent from the prior month to $1.4 billion, after quadrupling in January. In addition to tariffs, a cooling in world economic growth will likely continue to weigh on trade. The International Monetary Fund last week cut its forecast for global expansion to its lowest level since the recession. In the U.S., economists expect the country’s growth to decelerate less than originally thought in the first quarter but cut forecasts for the second half of the year, according to a Bloomberg survey this month. The merchandise trade deficit widened with Mexico, the surplus with Canada declined and the gap with Europe narrowed. After eliminating the influence of prices, which renders the numbers used to calculate gross domestic product, the goods trade deficit narrowed to $81.8 billion from $83.5 billion in the prior month. The real petroleum gap decreased as exports and imports both declined; excluding petroleum, the goods-trade shortfall narrowed to $69.2 billion. The report, originally scheduled for April 3, was delayed because of the partial government shutdown earlier this year. The U.S. typically runs a deficit in goods and a surplus in services.